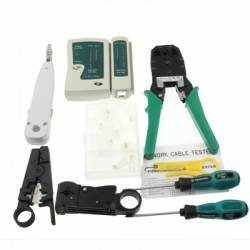 RJ45 and RJ11 Network Cable Tester White G-PC-0720 Quickly and easily checks network cablesChec..
1. Brand new high quality 2. RJ45 8 pins network cable heads / plugs 3. Gilded leads for better ..
Set Usage: telecommunications tools Impact and punch down tool x 1Coaxial stripping tool x 1Modular ..